Complete and submit the State of Texas job application online by going to the State’s employment website. The instructions in the below guide detail how to search for current job openings, create an online account, as well as how to properly complete and submit the online application form. Numerous career types can be applied for on the State’s website across a wide range of locations. About the Agencies: The State of Texas owns/operates a wide range of organizations across a diverse range of industries (e.g. medical, business, finance, research, transportation, and education). Step 1 – Click here to open the State of Texas employment site (“Texas Workforce”). Step 2 – Press the “Browse State of Texas jobs” link as outlined in the below screenshot. Step 3 – Enter an agency/university name into the first input field and then select a job classification from the drop-down list. Click the “Search” button to view the results. Step 4 – Click the name of the employer/job title link to further refine the results. Step 5 – Press the link of the job title to load the position description/summary page. 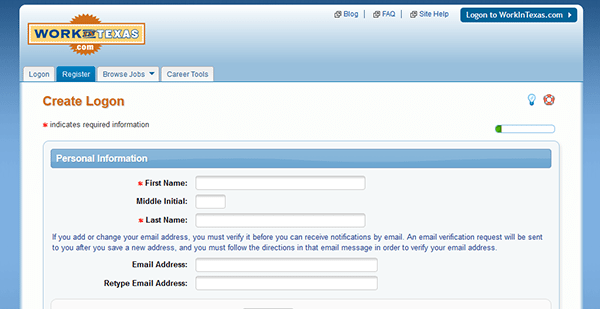 Step 6 – Review the job description and then click the “Register” link to load the account creation form. Step 7 – Accept the user agreement (click the “I Accept” button). Step 9 – Continue to fill in the the required information for each of the remaining sections of the form. 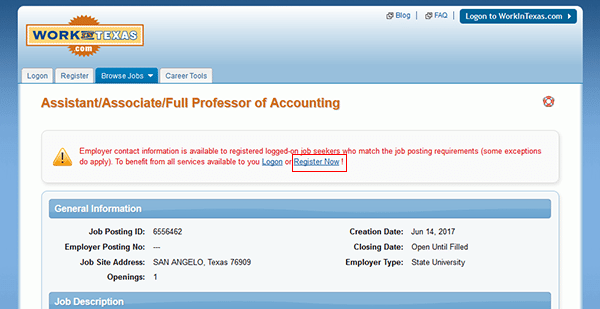 After your account has been created you will be able to apply for jobs on the State of Texas jobs site.